Long admired for the incredible detail, Les Très Riches Heures du Duc de Berry has been called "le roi des manuscrits enluminés" or "the king of the illuminated manuscripts." 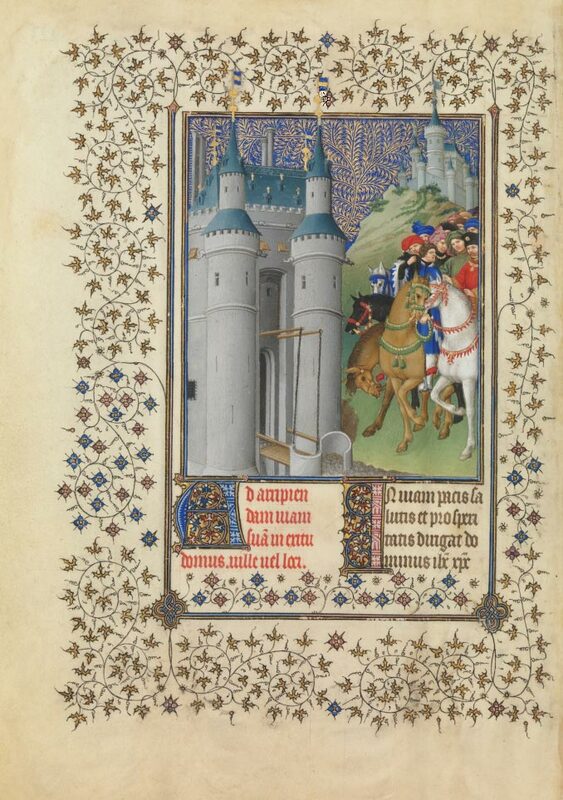 Commissioned by Jean, Duc de Berry in 1413, it was painted by the Limbourg brothers, Paul, Herman and Jean, who left it unfinished when all three of them died in 1416. Their tragic deaths were shortly followed by the death of their wealthy patron. The Black plague was sweeping through Europe and it was no respector of wealth or talent. All the planning and work that was put into this manuscript was almost lost forever when the work was shelved after their deaths. It passed through the hands of several owners who saw its worth and tried to have it completed. The unfinished illuminations were sent to various famous illuminators over the next 70 years but for one reason or another they either turned down the commission or were never hired to finish the work. Finally, Duc Charles I de Savoie commissioned Jean Colombe to complete the painting of the manuscript between 1485-1489. 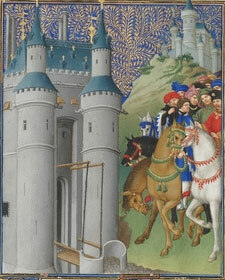 The first section, the most famous, is a calendar with images of life in late medieval France. The rest of the manuscript is filled with psalms and the story of Christ. Each page is fully described in the notes on thwhich I have found very helpful. The Limbourg brothers, natives of Nimwegen in the Duchy of Guelders (Germany), all showed great artistic promise when they were just children. Their father, Arnold of Limbourg, was a sculptor in the employ of Duc de Bourgogne. Their uncle, also an artist employed by Duc de Bourgogne arranged for Paul and Herman to apprentice to a goldsmith in Paris where they worked and studied until they were sent home because of the plauge in 1399. On their way back to Guelders, their driver unwittingly blundered into the middle of a military conflict between Brabant and Guelders. The young men were thrown into prison. It took six months for the goldsmith's guild of Paris to raise the bail and get them released. However, the brothers had to sign a voucher that they would pay back the guild for the bail. Out of consideration for their uncle, the Duc de Bourgogne paid the vouchers and retained the brothers to illustrate a beautiful Bible from him. There is also a record of Paul painting a forest on the walls of the Duke's château. It is presummed that Paul and his other brother, Jean, both worked in Paris for the next four years until the death of the Phillip le Hardi, Duc de Bourgogne. Between 1404 and 1408, Jean moved back to Nimwegen and bought a home with his brother Herman. Perhaps they set up a studio together. The new Duke took such a great liking to Paul Limbourg that he even abused his power on his friend's behalf. It seems Paul was in love with an 18-year-old girl of Bourges named Gillette le Mercier. Her mother would not give her consent to their marriage so Duc Jean de Berry had her kidnapped. The Paris Parlement got involved and had the woman returned. It is not clear if these lovers ever married but Paul did marry and his wife outlived him by 20 years. In 1410, Herman and Jean gave their home and furnishings to their mother and moved to Paris to work with their brother Paul. 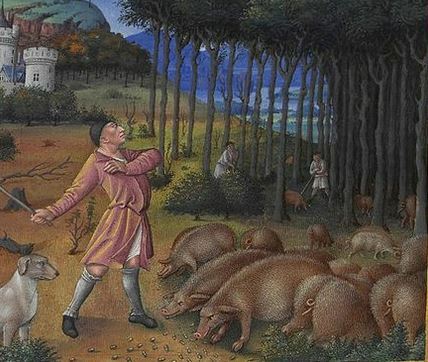 Paul and his brother were lavished with gifts by the Duc de Berry including a hostel in Bourges, a diamond ring, and an emerald and gold ring engraved with a bear sleeping on a bed of emeralds. They are best known today as the illuminators of the Belles Heures and the Très Riches Heures but they also created two other books of Hours and numerous pages to be inserted into other books of hours. They also created court art for shields, banners, tapestries, and other works. Though they were already famous in their own time, we can only imagine how much more they could have created if they had not all succumbed to the plague in 1416. —Gael Stirler Send us your ideas for cool websites to share. If you want to add this article to your list of favorites or email it to a friend, please use this permanent URL, https://stores.renstore.com/-strse-template/0512B/Page.bok. Permission is granted by the author to quote from this page or use it in handouts as long as you include a link back to Renstore.com.